Using this feature, you can turn off (or on) chart font autoscaling for one or many charts in your workbook, and you can also fix the default behavior for new charts. Older versions of Excel® (prior to the 2007 version) will autoscale chart fonts by default. This means that when you change the size of a chart, the font size will automatically get changed, too. Often this has the undesired effect that the text will be too small to read. The Autoscale Chart Fonts feature of the XL Toolbox offers you the option to disable (or enable) chart font autoscaling for the selected chart, all charts on the current worksheet, or all charts in the current workbook at once. You can turn chart font autoscaling on or off for all new charts that you create. Note: When you change this setting, the new setting will only take effect after you restart Excel. 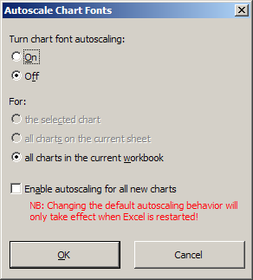 Excel® 2007 no longer supports chart font autoscaling. Therefore this XL Toolbox feature is not available in Excel® 2007-2013.